Join us as we celebrate new beginnings in East NY! As we reflect on the fulfillment of God promise to pour out His Spirit on all flesh, may we be so empowered to live victorious lives not by might, nor any strength of our own, but by His Spirit. 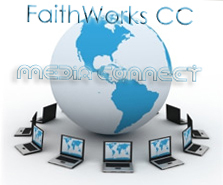 Wednesday Morning Prayer: 8:00 AM | Saturday: ManTalk: 7:30 AM - 8:30 AM | Daily Ministry Online here at FaithWorks Christian Fellowship Online! In this season of new beginnings, we are looking forward to great things happening in the Kingdom of God. We continue to invite you to join us as followers of Jesus Christ as we engage worship, declare praise and prove God at God's Word again and again. Many of you know that FaithWorks Christian Fellowship is currently in a season of transition as we are no longer meeting at 111-17 Sutphin Blvd., where we gathered for local assembly. In this season, the scriptures remind us that where two or three are gathered in the name of Jesus, truly our Lord is in the midst. Thus we continue in the deportment of ministry here online, and "house to house" as the Lord would allow. For truly the Kingdom of God is at hand. We trust that God is a promise keeper - that He is not only with us, but that God is indeed directing our paths. And so we embrace God's plan to prosper us and not to harm us, as we glorify Him with everything we have within us, and edify His people with that which He desires to place within them. We are also thankful to God for our brothers and sisters in Christ who have opened their arms, hearts, minds, and houses to love us to life. We have been privileged by God's grace to begin the process of joining the ministry efforts and family of Open Bible Churches under the leadership covering of Bishop Richard Vedilago, and Shepherd's House OBC. Their love and support have been an integral part of our "second wind" to press forward. 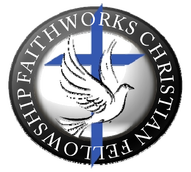 Thus far the ministry of FaithWorks has been an exciting journey, but the assignment is yet before us - to extend the Gospel message to a dying world in need of salvation through our Lord and Savior Jesus Christ. We will continue our journey of faith following the model of the early church, breaking bread from house to house and gathering here online as the Spirit guides us. Stay plugged in for updates! As proximity has never been an excuse, and now even more so, if you have a desire to receive Christ's invitation to rise to higher place in him, join us. We pray the Lord will lead you to visit us in fellowship and commitment as convenience and yes even sacrifice might allow. So grab your friends, family and your Bible, and join us in fellowship this year as we continue to "engage authentic worship, declare worthy praise, and prove God at God's Word ... again and again!" A time of prayer and intercession with sisters of the faith engaging the Power of Agreement.Take advantage of the privilege to pray for someone in need, as we agree with one another according to the will of God for breakthrough at the FaithWorks Telecenter.